Failure to respond to treatment by patients with borderline disorder can often be traced to three major problems: 1) inadequate medication management; 2) the use of an ineffective psychotherapeutic approach; and 3) undiagnosed or ineffectively treated co-occurring disorders such as substance abuse. The latter two issues are discussed elsewhere on this site. It has been my clinical and research experience in treating BPD for over 50 years that medications often provide a necessary foundation for the effective treatment of the disorder with psychotherapy. The introduction of effective pharmacological treatment for borderline disorder occurred in the mid 1980s. This may explain why almost a decade later different forms of psychotherapy became consistently effective after having failed to do so for a century. There are two other reasons why it is appropriate to use medications promptly in the treatment of borderline disorder. First, they’ve been shown to be helpful in rapidly stabilizing emotional disturbances and harmful aggression directed at themselves and others. This does not occur with any form of psychotherapy introduced to date. Second, medications are also effective in treating certain symptoms of borderline disorder that have not been shown to be responsive to psychotherapy, such as high levels of suspiciousness, paranoid symptoms, disturbed thought processes including irrational and split-thinking and acute episodes of dissociation under distress. Nonetheless, a number of psychotherapists and at least one prominent, foreign governmental medical advisory group (NICE) proclaims that medications should not be used in the treatment of borderline personality disorder. This is in spite of significant research evidence to the contrary and the increasing agreement of many psychiatrists and non psychiatric therapists that the combined approach is more effective than either pharmacotherapy or psychotherapy alone. Also, beware of any borderline disorder treatment program that states medications alone are all that are required in the optimal treatment of the disorder. I have seen and treated the occasional patient for whom this is true, but in most cases, psychotherapy is also required. Some patients with borderline disorder are resistant to taking medications, regardless of the severity of their symptoms. 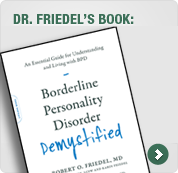 Under these circumstances, it is helpful to understand that borderline disorder is primarily the result of inherent biological disturbances in certain chemical processes required for optimal brain function. Medications serve to improve the function of these processes, thereby reducing symptoms and enhancing the therapeutic results of psychotherapy. Also, over time, the improvement in these biological processes resulting from medications and effective psychotherapy often result in a decrease in, and sometimes even the discontinuation of, the medications initially required. The effectiveness of medications in the treatment of borderline disorder depends on: 1) the specific symptoms;27 2) the medication selected; and 3) the biological make up of the person with borderline disorder. In other words, the medications that work best for you may not be effective for another person with borderline disorder, even if they have very similar symptoms. Consequently, it may take some trial and error by your psychiatrist and you to determine which medications and doses best match your unique chemistry.